Charles Floyd was born in rural Bartow County, Georgia, on 3 February 1904, the son of a farmer-bootlegger. In 1922 he tried to rob a post office but was caught and almost ended in jail, saved only by his father giving him an alibi. The next time he was not so lucky. On 11 September 1925 he stole $16,000 from a Kroger store in St Louis. It was from an eyewitness that day that he earned his “Pretty Boy” nickname. It was said that he was “a mere boy — a pretty boy with apple cheeks”. Like Baby Face Nelson, Floyd hated his nickname. The haul also earned him his first spell in prison. On 19 December 1925 he began a five-year stretch at the Missouri State Penitentiary overlooking Jefferson City. On his release after three years, he moved in with Juanita Baird, the wife of a drug dealer, his own wife, Ruth Hargrove, having divorced him. The police began keeping the couple under surveillance and, to escape them, he moved to East Liverpool, Ohio. Between January and March 1930 Floyd and his gang committed a number of robberies there. On 8 March he was arrested after a gang member shot a policeman. Tried and convicted, he was sentenced to 15 years in prison but escaped from the bathroom of the bus taking him to jail. He returned to Kansas City where he was reunited with Juanita Baird and was joined by her sister, Rose, and a new confederate, William “Billy the Killer” Miller. Floyd and Miller killed the husbands of the Rose and Juanita, before travelling east to rob banks. On 16 April 1931 in Bowling Green, Ohio, a shop assistant recognized Floyd from a wanted poster and rang the police. A gun battle ensued on South Prospect Street and Patrolman Ralph Castner was shot, dying a week later. Miller was also killed and the two women arrested. Floyd escaped to Cookson Hills, Oklahoma. Floyd and his partner George Birdwell, robbed banks in Earlsboro, Konawa, Maud, Marble City, Morris, Shamrock, Tahlequah. On 12 December 1931 they robbed two banks in one day at Castle and Paden, Oklahoma. On 3 April 1932 he was shot during yet another gun battle. In the autumn of 1932 Floyd took up with Adam Richetti and they resumed their activities in May 1933. On 17 June, during an attempt to free gangster Frank “Gentleman” Nash, five men including FBI agent, Raymond Caffrey, were killed in what became known as the Kansas City Massacre. Floyd denied any involvement but the FBI claimed fingerprint evidence linked him to the crime scene. On 19 October 1934 Floyd was identified as one of the three robbers of the Tiltonsville Peoples Bank. 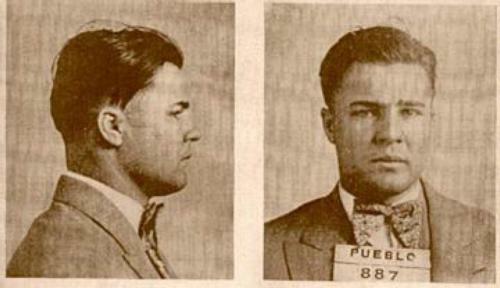 On 22 October 1934 Floyd was killed in a shoot out with the FBI. He had been staying at the Conkle farm near Clarkson, Ohio, after Ellen Conkle took pity on him. As her brother, Stewart Dyke, prepared to drive Floyd to the bus garage, the police arrived. In November 1929 Floyd’s father died during an argument with his neighbour, James Mills. Floyd returned for the funeral and shortly afterwards Mr Mills disappeared.